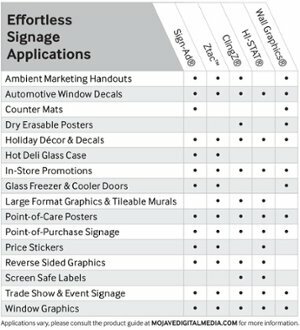 Innovative film substrates for temporary marketing & signage applications. Sign-Ad® – Low tack flexible vinyl, for use on removable, high quality interior & exterior graphics on smooth surfaces. ClingZ® – Adhesive free, electrically charged polypropylene film that adheres to any dry interior surface. Ztac™ – Ultra low tack, repositionable polyester film, designed for use on very smooth indoor surfaces. HI-STAT® – Highly plasticized, flexible, cling vinyl film, that adheres to most clean, polished smooth, indoor surfaces. Wall Graphics® – Ultra removable & reusable adhesive vinyl ideal for decal applications requiring easy removability. 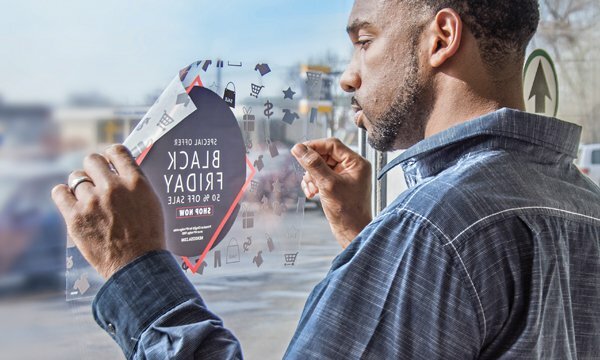 NEKOOSA OFFERS A VARIETY OF SIGNAGE MEDIA DEVELOPED FOR ANYONE TO APPLY, RESPONSIVE, AND REMOVE, WITHOUT LEAVING A TRACE OF ADHESIVE RESIDUE.